Hello guys after long time, MS Design Publish another Bangla Blogger templates. Palki 2 is another popular and creative blogger template by MS Design. Previous some days we published Palki 2 - Responsive Blogger Template. After that time now we publish Palki 2 Bangla version for Bangladeshi blogger. This template perfect for every Bangla blog. If you're running a bangla blog then Palki 2 Bangla blogger template is perfect for your blog. Palki 2 is responsive and SEO Optimized free blogging template. We always focus on Search Engine Optimization. That's why, SEO friendly template developing is one of our biggest challenge. Mobile friendly Blogger template is also important is better SEO Result. So, use a high performed mobile friendly blogger template on your blog. Palki 2 is also a mobile friendly template. Try this out now. 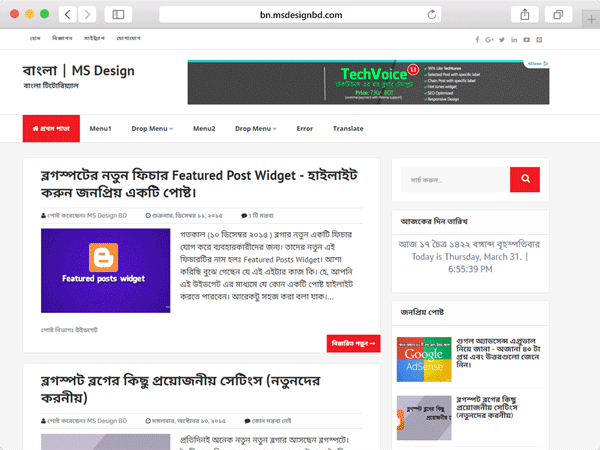 What a nice blogger template for bangla content, thank you very much for sharing this wonderful template for bangla blog.